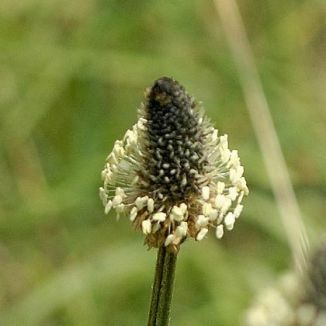 Ribwort Plantain is not easily confused with other wild plants on this web site. Pollen records tell us that this plant of waste places, tracks and meadows has been with us for more than 5,000 years. 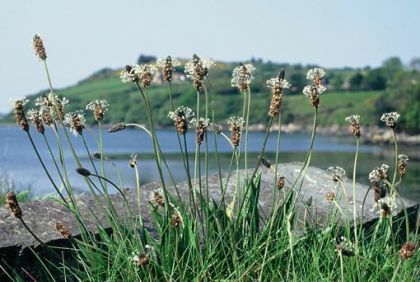 It grows in both urban and rural habitat, on walls, in lawns, by the sea, and is probably overlooked by most as its tiny flower barely registers as such for most people. It has a little tiny brown-green head with large pale-yellow stamens which stand out clear of this little spike on top of a furrowed stalk. Growing to 15cm high, this wildflower has been given the name of 'Rat-tail' and one can see why. The 4cm long flower heads are borne on a long dark stalk about 40cm long. The long, lanceolate leaves have three to five very distinctive ribs and spread from the base of the plant in a rosette. This plant flowers from April to October and its fruit is a many-seeded capsule. It is a native plant belonging to the family Plantaginaceae. I first identified this plant in Roundwood, Co Wicklow in 1976 and photographed it in Allihies, Co Cork in 1984. *'The leaves of Slánlus are very good for a fresh cut. It is plucked and chewed up and then applied to the sore. This prevents blood poisoning and encourages healing'. **'Slanless is used for feeding turkeys'.